Despite these advantages, it is important to know that old and poorly maintained garage doors pose a safety threat. Here are the garage door problems you should know about along with a solution to each. The single biggest threat posed by a garage door is closing on a child causing injury or death. Garage door systems are now designed with a motion sensor that detects movement in the path of the door. If motion is detected, the sensor signals the door to stop coming down and reverse upwards. Old systems don’t have a sensor and should be replaced immediately. Systems with a sensor must be maintained because the sensors can become covered with dust or debris or misaligned if bumped. These issues can lead to the failure of this security measure. Clean the sensors on your garage door system, and make sure they are pointed straight across the opening of the garage. Similar to the photoelectric sensor, the automatic reverse feature causes the door to rise if it strikes something as it closes. You can test to see if your system has this feature by placing a board or large stone where the garage door meets the floor and lowering the door. It should strike the object and immediately reverse course. Old motors without a properly working safety reverse should be replaced as soon as possible. Imagine a child or pet being trapped beneath the door! Garage door springs represent two dangers. First, they are under great tension. If one breaks, it uncoils with tremendous power. Breaking tension springs have caused many serious injuries and tragic deaths. To avoid harm, never work on your own garage door springs. Leave the job to a professional. The second danger from a broken spring is that the garage door can suddenly free fall. Since doors can weigh 150kg or more, it is easy to see the potential harm from one falling on a person or pet. That would put a nasty dent in your car too. The very best garage doors are designed with an integrated safety device that halts the fall of the door in the event a torsion spring fails. When manually closing a garage door, it is a common but unsafe practice to grab the top of a panel and pull the door down rather than using the garage door handle. If hands aren’t removed from the panel fast enough, fingers might be trapped between the panels, a danger that can cause crushed bones and nerve damage. This issue is easily avoided by using the handle of the door. A surefire way to prevent it is to install a garage door like those from Evenglide with a panel profile that won’t trap fingers. The causes of this behaviour range from faulty wiring to a system that will close when the neighbor uses her automatic garage door opener. While this seems a nuisance rather than a real danger, what might happen if you were running your car or a generator in the garage when the door closed? The result could be carbon monoxide poisoning and potential death to anyone in the garage or home. 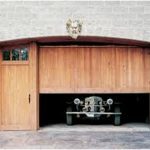 If your garage door closes for no apparent reason, have it serviced immediately. In addition, if you’re going to run your car while you’re not in it, back it out of the garage first. Further protection will be achieved by installing a CO detector in the garage or in your home on a wall shared with the garage. This entry was posted in Home Improvement and tagged Automatic Garage Door Opener, Breaking Spring, Co Detector, Garage, Garage Door, Garage Door Opener, Garage Door Problems, Garage Door Springs, Garage Door System, Garage Door Systems, Garage Door Torsion Spring, Garage Doors, Garage Protection, Liftmaster Garage Door Opener, Motion Sensor. Bookmark the permalink.